1. Please read the following guidelines carefully and seek clarifications from the Head Examiner in case of any doubt to reduce subjectivity and bias. 2. Credit should be given to student writing the concept in his own language. Marks should not be deducted for non use of bookish language. 3. Every care has been taken to prepare the Marking Scheme. However, it is important to keep in mind that, it is neither exhaustive nor exclusive. Full credit should be given to candidates who give relevant points other than the ones listed in the Marking Scheme as the answers to the questions. The examiners are requested to use their own knowledge and experience wherever necessary. 4. The Marking Scheme carries only suggested value points for an answer. These are only the guidelines and do not constitute the complete answer. The students can have their own expression and if the expression is correct, the marks should be awarded accordingly. 5. Marking should be neither over-strict nor over-liberal. Marks should not be deducted for spelling errors, wrong proper names, minor inaccuracies or omission of detail. No marks should be deducted for overshooting word limit. 6. Though break-up of value points is given in a number of answers, the examiner may be flexible in marking the different parts, if the answers reflect understanding of the scope of the question. 7. A full scale of marks 0-100 has to be used. Please do not hesitate to award full marks if the answer deserves it. 8. 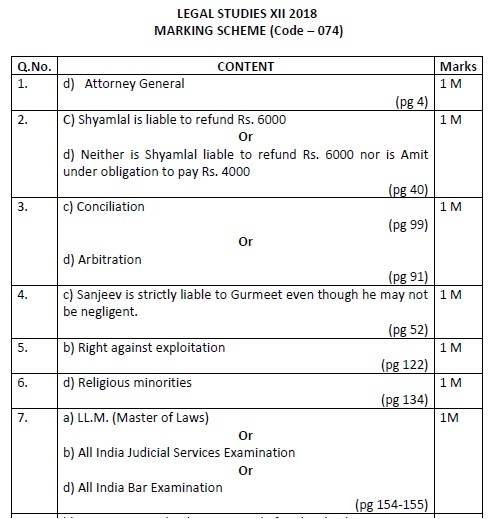 As per orders of The Hon’ble Supreme Court, the candidates would now be permitted to obtain photocopy of the answer book on request on payment of the prescribed fee. All Examiners/ Head examiners are once again reminded that they must ensure that evaluation is carried out strictly as per value points for each answer as given in the marking scheme. 9. All the Head examiners/Examiners are instructed that while evaluating the answer scripts, if the answer is found to be totally incorrect, the (x) should be marked on the incorrect answer and awarded (0) marks.